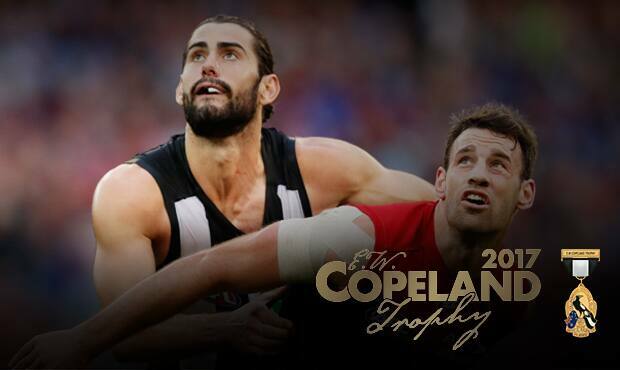 Grundy claimed the Jack Regan Trophy at Friday's Copeland Trophy. Image: AFL Photos. It’s hard to believe Brodie Grundy is still only 23 years of age. He plays like a seasoned ruckman. And as is evident by his perspective on life outside of football, he’s wise beyond his years. In 2017, the South Australian took another step towards mastering his craft, averaging a career-best 36 hit outs and 18 disposals across his 20 games. With 92 votes in the E.W. Copeland Trophy, Grundy adds another top five finish to his growing resume, and claims the 2017 Jack Regan Trophy in doing so. A physical presence, but a composed one at that, Grundy was a dominant force in the Magpies’ midfield this year. When he faced the Demons on Queen’s Birthday, he broke his personal best for both hit outs (53) and tackles (11), and recorded more than 20 hit outs in every game barring one in 2017. The only sour note in what was an impressive campaign for Grundy was a two-week suspension, handed down to him for a rough tackle on North Melbourne’s Ben Brown in round 20. With 82 games of experience and a new three-year contract extension under his belt, Grundy is the ruckman Collingwood have sought-after for so long. “I love the football club. I love playing here,” Grundy told Collingwood Media after announcing his new contract earlier this year. Well Brody, we love having you here.